My name is Jedadiah Richards and I am from Rapid City, South Dakota. I am of the Oglala Lakota Nation and was born in Pine Ridge, South Dakota. Thinking back to how much I’ve been able to grow since the NYLA National retreat in 2013 to 2015, I am able to say that with confidence I’ve been able to grow the vision of having a viable career as a filmmaker/writer for my community. 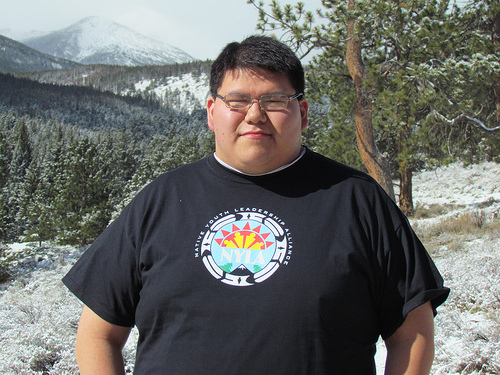 Working with NYLA fellow, Jesse Shortbull, I’ve been able to write several scripts that provide a unique perspective about young Native Americans overcoming various challenges in their lives to contribute back with a positive focus. These scripts have been submitted to the Sundance Film Institute Native film workshop and other organizations and as an emerging writer I understand to make my voice heard will require patience and resilience because I am competing against others from around the country and world. When I am not writing, I’ve been able to grow my technical skills as a production assistant with KOTA, a regional ABC television affiliate in the Rapid City, SD. In this role, I am responsible for operating the camera and teleprompter during the morning, afternoon, and evening broadcasts. I also work with news producers on developing and creating the graphics for the live broadcasts. I appreciate the perspective this job has afforded me because I am able to step from the creative side of content creation to learn the finer points of production that will help as I move into leadership positions within content creation. I am currently exploring several arts schools including the Institute of American Indian Arts (IAIA) for my bachelor’s degree and hope to continue onto an advanced degree at the UCLA film school or NYU-TISCH school of arts. With all of the opportunities and networks I’ve been able to gain because of NYLA, I am able to see a brighter future for my community and myself. Considering if I didn’t join NYLA, my current position would be as far as I could go. But now with the ability to harness my own NYLA spark, I know this is only the beginning. I can’t wait to see what the future holds for me in the film industry!